Medley, FL – On May 7, 2014, All Florida Paper, a leading private distributor in the United States was recognized for its achievements and innovations in Marketing as the company’s marketing head was named a National Finalist for Marketing Professional of the Year in The 2014 American Business Awards (also known as The Stevie Awards®), and will ultimately be a Gold, Silver, or Bronze Stevie® Award winner in the program. Named the Academy Awards (OSCARS) of the business world by The New York Post, The American Business Awards are the nation’s premier business awards program. All organizations operating in the USA are eligible for nomination – public and private, for-profit and non-profit, large and small. More than 3,300 nominations from start-ups to Fortune 500 companies in virtually every industry were submitted this year for consideration in a wide range of categories, including Most Innovative Marketing Campaign of the Year, Marketing Department of the Year, Brand Experience of the Year, and Company of the Year among others. The American Business Awards will be presented at two awards events: the ABA’s traditional banquet on Friday, June 13th in Chicago and the new product & technology awards event on Friday, September 12th in San Francisco. The awards banquets will also be broadcasted on 300 radio stations across the United States. Mr. Caceres concluded by saying, “the key to everything we have accomplished as a team in our marketing department has been Alexander Hannett, our Manager of Corporate Strategy and Marketing.” Mr. Hannett has been the vision behind many of the initiatives since 2012, and has worked with our COO, Marisel Caceres in pushing those initiatives forward. Mr. Hannett currently manages the website, brand and overall marketing department and corporate strategy initiatives of All Florida Paper. In collaboration with the CEO and COO, he developed the company’s industry leading website, managed all the intellectual property of the company and has re-branded many parts of the company, including HR, recruiting and employee retention initiatives. In addition, he was worked with the sales department in showcasing the company’s vendors to customers in order to push key products. In the next several months, Mr. Hannett and All Florida Paper have many new initiatives planned, including email marketing campaigns, a new sanitation program for food service facilities, and expansions in vendor product knowledge training and media relations. National Finalists were chosen by more than 150 business professionals nationwide during preliminary judging in April and May. 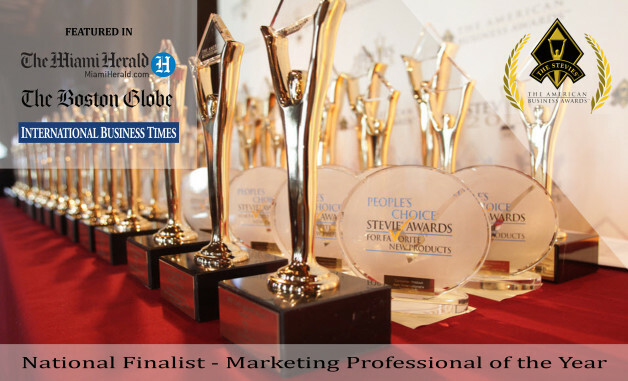 More than a hundred of the most successful business professionals in America, including people like Donald Trump, Tony Robbins and Gary Hamel will determine Stevie Award placements from among the National Finalists during final judging period, to take place from May 13th to 22nd. “The final judges have a difficult task ahead of them, to rank the Finalists, because there are so many great nominations this year,” said Stevie Awards president and founder Michael Gallagher. For more information or to request an interview, please contact the media relations division at (786) 594-5240 or at contact@allfloridapaper.com. Details about The American Business Awards and the list of National Finalists in all categories are available at www.StevieAwards.com/ABA.